Don't upset the machine, OK? I’ve been doing a little thinking about Survivor: Ghost Island. Now that I’ve written my preview, I’ve listened to several podcasts and read plenty about the season. But nobody seems to mention something that I think is pretty important. If you’ve been reading this here column since the beginning, you know that I tend to apply theories of social identity or priming really early on each season. If you haven’t read this here column before, welcome. I apply theories from disciplines such as communication, mass communication, sociology, psychology and organizational communication to help us understand why what happened on each episode happened. And I almost always start out with social identity or priming because Survivor producers often explicitly apply these theories in forming tribes. By calling a tribe “brains” or something, you’re forming, or reinforcing, someone’s identity. By calling a bunch of mostly mediocre players “game changers,” you’re priming them to think about Big Moves™. But back in the middle years of Survivor, this type of stuff rarely happened. 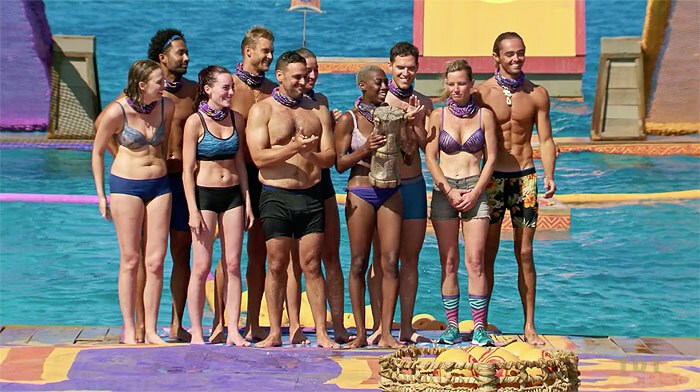 And that’s what I think people are missing about Ghost Island: Not since Season 19 (Survivor: Samoa) and the first incarnation of Russell Hantz have producers simply put the castaways into two tribes without adding some generic labels like “white collar” or biological labels such as “female.” This is almost classic Survivor, a season of good players who’ve mostly been fans of the show on a season whose theme is about the place it’s being filmed (sort of in this case). That’s kind of cool, don’t you think? When Samoa aired, I was still a music critic living in potentially the most underrated city in America. And Russell Hantz was just an unorthodox, potentially really good player and not some creepy weird dude with horrid relatives. But, alas, we’re not here to reminisce about the end of The Aughts. We’re here to talk theory and understand why, potentially, Gonzalez and Jacob received the unceremonious boot from their fellow tribemates. And to figure that out, I’m going to return to organizational theory and the great Gareth Morgan, a Canadian professor best known for his work surrounding organizational culture. Basically, Morgan, like many sociologists and business researchers, does a lot of work trying to understand why organizations are successful and why they fail. Morgan published an incredibly influential book titled Images of Organizationback in 1986. In the book, he used metaphors to describe some types of successful organizations. We’ve probably all worked for a variety of organizations, so we know there isn’t one type that succeeds and one type that fails. So much is dependent on the type of organization and, really, many other facets. But I always think of Morgan’s most simplistic metaphor, the organization as machine, when I think about Survivor’s early game. The metaphor of “organizations as machines” sees an organization as “a pattern of precisely defined jobs organized in a hierarchal manner through which precisely defined lines of command or communication exists” (page 24). This theory does not factor in the feelings or decisions of workers very much, but looks at them as simple cogs that do their clearly defined jobs, which all work together for the overall goal. This type of organization sometimes dehumanizes employees. And that’s the early game of Survivor, right? We’re talking about tribes trying to succeed at the important stuff such as making a shelter, figuring out chores and winning challenges. The people that often get the boot early are broken parts in the machine. We always see lazy people, folks bad at challenges and, especially, people who stick out go home. On this week’s two episodes, we saw Gonzalez trying to play the game way too early. The tribe is just trying to robotically accomplish early goals, not strategize too openly. She did that and put a target on herself. Same with Jacob. He talked too much. He became a full-fledged human and not a cog in the wheel. We saw this on the other tribe with Domenick early on. He spoke out. He made himself an autonomous human, someone not part of the machine. And he would have received an exit, I think, if his tribe lost the first challenge. In general, the best way to make the merge, I think, is to be cog in the wheel, to be part of the machine. You don’t want to stick out for any reason. Just be one of the guys and start making moves post merge. Make sense? OK, well that’s enough theory. Let’s take a look at what I think of each remaining player after 120 minutes. 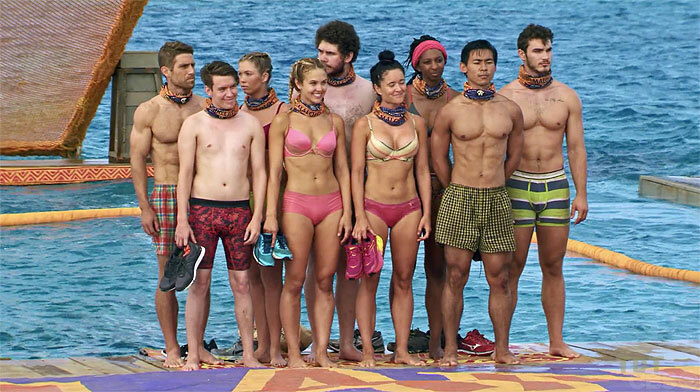 Laurel: At first, I thought my Winner Pick™ might be in trouble because her tribe looks so amazingly outmatched in challenges. But if next week’s preview is to be believed, this might not be an issue much longer. In general, though, I got some heat via the tweets about picking Laurel because she seemed so “conceded.” Well, nothing at all hinted at this last episode. And Corinne picked Laurel, so I must be doing something right. Jenna: Like most folks in the first episode, Jenna didn’t receive much screen time. But unlike most folks in the first episode, Jenna can apparently “manifest” anything she wants. Why oh why does she not want screen time? 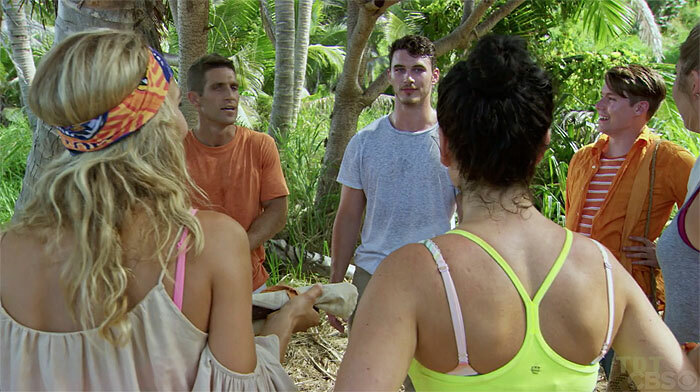 Donathan: OK, forgive me for being an a** for second because Donathan seemed incredibly likable this episode. But, come on. Probst, at Tribal, literally said that everyone contributed to a challenge loss except Donathan. Really? Was I the only watching the part where his team literally begged him to simply get in the damn water and he acted like a scared, petulant child for a decent amount of time? Give him credit, he finally did it. Don’t give him too much credit, though. Come on. Besides James, nobody was more responsible for that challenge loss. James: I feel like one of the things that separates decent athletes with great ones is the ability to not get caught up in a moment. You know, like clichés such as play your game or whatever. But for a decorated collegiate athlete, James totally shrunk in the moment. I’m not sure if he’s a good enough swimmer to dive down eight feet (I bet he is), but the way he could only put his head in the water and then come back up? That’s the sign of nerves and shrinking in the moment. James was afraid. Hopefully, for him, now he’s got his legs under him and it won’t happen again. Stephanie: I’ll be honest, I very much have a crush on Stephanie right now. She killed it this week. The way she worked her alliance, got Jacob to talk, performed in challenges… this woman can definitely win this game. Brendan: So far, Brendan’s done better than expected. At least to me. I thought for sure he would be too bossy. But Brendan owns some serious intuition skills and knows exactly how to make his point while making others feel valued. I thought his age might disqualify him in this season, but I’m thinking I could be wrong. Libby: I saw very little of Libby. Or at least I didn’t notice her. I’m thinking she is easily this season’s invisible good-looking woman who goes out right after the merge. Michael: For a little while, it looked like Michael might be wise beyond his years. But the second episode hit and you could see him clearly whining, or at least pouting, about things potentially not going his way. And then I remembered a few years ago, the last time I taught freshmen. Yep. That’s Michael. Desiree: OK, I know people might think she sucked at the puzzle. But in Desiree’s defense, they probably don’t have slide puzzles at the college gym Desiree apparently frequents. Kellyn: Well, a couple things about my neighbor 25 minutes to the southeast. One, she did so well in that puzzle challenge. Two, I finally know how to pronounce her name. Thanks Probst. Wendell: This dude seems like he’s in a good spot. Everyone likes him and everyone thinks he’s in their alliance. And Wendell seems like the kind of person everyone likes. And he’s not going to rub anyone the wrong way. I’m liking Wendell’s chances. Morgan: Save Shamu! I know Morgan spoke a bit during the episodes, but I really don’t remember what she said. So, I can only pay tribute to Shamu, a wonderful whale that SeaWorld does potentially bad things to on a daily basis. Watch the movie. Chris: You know, his bio read kind of badly. But nothing prepared me for what this dude is like. I know, I should have known. I should have seen the word “model” and saw the chain … I apologize. I mean, I’ll give credit where credit is due and say he totally saw through Domenick, but, man, I cannot root for Chris. Sebastian: We rightly didn’t see much of this tribe, but besides receiving a new nickname, I remember very little about Sea Bass. Chelsea: Do. Not. Remember. Even. For. A. Second. 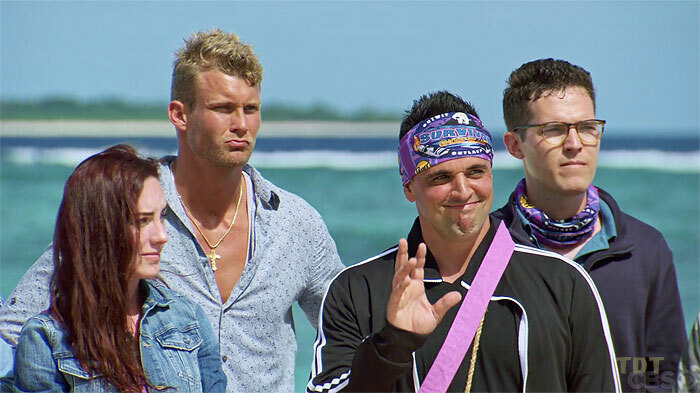 Domenick: Well, my prediction about Domenick not knowing how to shut his mouth came true very quickly. Very quickly. I’m guessing he goes home if they lose that first challenge. But good for this dude for righting the ship quite a bit. I still think he has about the same chances of winning that I do, but, hey, he’s at least sticking around for our entertainment. That’s cool. Bradley: I don’t remember seeing Bradley at all this episode either. But I think know why in this case: Bradley was probably sitting near the water, staying away from the simpletons, damning Harvard Law for not letting him in and dreaming of the next time he can put on his Nantucket Reds and Sperry shoes to go lobstering. He did that so much, he didn’t make the edit. Angela: Now, Angela, I even looked for her because I thought she’d be a trainwreck. I didn’t see her. Good for her. I really thought her downfall would be sticking out too much. But, so far so good. OK, well that’s it for me this week. Let’s talk some theory again after next episode. I hope everyone enjoys a good week.